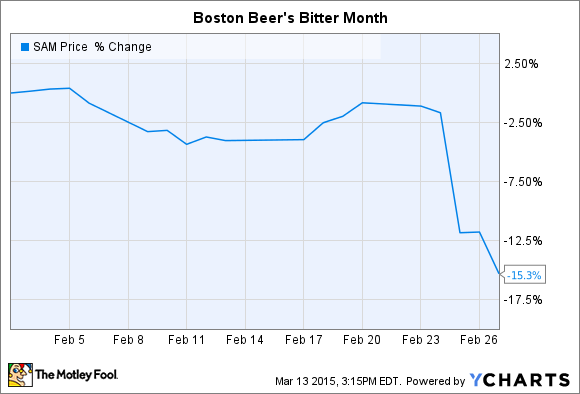 What: Shares of craft beer giant Boston Beer (NYSE: SAM ) fell 15% last month. The stock had reached an all-time high of $324 per share just a month earlier, but turned sharply lower to hit $267 per share in the last week of February, according to S&P Capital IQ data. So what: Wall Street flashed its bitter-beer face to the fourth-quarter earnings results released on Feb. 24. In that announcement, Boston Beer said revenue improved by 6% to $218 million. Wall Street pros were holding out for a bigger sales gain of 15%. To top it off, management’s forecast for 2015 called for depletion growth, a key measure of product sales, of just 10%. That’s less than half the 22% pace Boston Beer set in the past two fiscal years. Now what: There are two main drivers behind Boston Beer’s soft 2015 forecast: more competition and fewer product launches. The company is losing market share to both big and small brewers as competition heats up in the craft beer industry. That shouldn’t come as a surprise. While Boston Beer had a massive hit with its Angry Orchard franchise, it was only a matter of time before other brewers elbowed into the cider business.